U.S. troops patrol in the Baraki Barak district of Logar province, Afghanistan. Reporting in Afghanistan isn't just challenging because of the security concerns and the complexity of society and the stories here; it's challenging because "facts" are often in the eye of the beholder. Just last week, an incident that seemed to be factual is now an open question: Was there a deadly firefight or not? "Four children were killed in a heavy exchange of fire between NATO and insurgents in Shahid Khail and Uzbek Khail areas of Baraki Barak district of Logar province on Sunday afternoon. "The children were grazing animals on the field when they got stuck in the crossfire between NATO and insurgents." 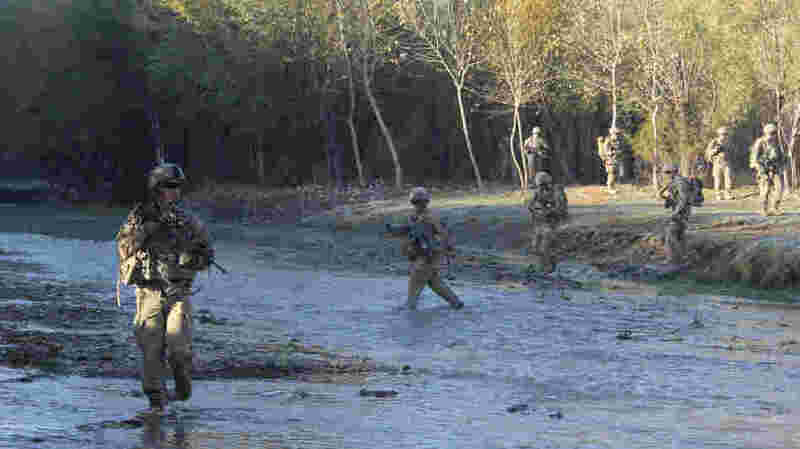 "The International Security Assistance Force (ISAF) has completed its initial assessment of the circumstances of the Oct. 20 operation against known insurgents in Baraki Barak district, Logar province. In addition to the insurgents killed during the operation, ISAF may be responsible for the unintended, but nonetheless tragic, death of three Afghan civilians." Tuesday evening, U.S. troops were at the coalition outpost in Baraki Barak, preparing to send a small delegation to the provincial capital of Pul-e-Alam the next morning. They were going there to make a payment to the families of the victims. But some troops said there were still many outstanding questions, and NATO was not admitting fault. First, there were discrepancies on how many children were killed. The ISAF press release said three. Troops in Baraki Barak said an Afghan official told them two were killed, and another said four. Second, the ISAF statement said the incident took place on Oct. 20, and the Afghan official claimed it was Oct. 21. Third, some U.S. troops in the area said there was no firefight. There were no coalition forces on the ground at the time of the incident. There had been a precision airstrike against an insurgent in the district, and their remote surveillance of the scene indicated the possibility of casualties other than the targeted insurgents. When asked for new details today, ISAF officials said the account hadn't changed. Still, ISAF went ahead with payment to four families, despite the lack of hard reporting on what actually happened. It did so because the financial cost of $20,000 per family was much less than the political or security cost of disputing the incident. It could undermine public support for ISAF and drive a deeper wedge between the Afghan government and coalition forces. Afghan President Hamid Karzai issued a typically pointed statement decrying the killing of innocent civilians. One U.S. military officer said Tuesday night the officials in Logar were almost always wrong in their public statements about incidents in the province. While ISAF itself isn't always correct and doesn't always provide a full account of events, this does touch on a constant source of frustration for journalists here. Usually, ISAF gives out minimal information at the time of an event, then reporters must rely heavily on statements from Afghan officials who rarely witness the incident in question. Very often, their initial reports are inaccurate, or contradicted by other officials, and if clearer accounts do emerge down the road, it's unlikely there is much follow-up coverage. This case, though, is particularly vexing, given the cavernous gap between the statements by Afghan officials and ISAF. It seems safe to report that three or four children were killed last weekend, and their families were definitely compensated by NATO. Whether they were killed as a result of gunfire, a coalition airstrike, insurgent activity or some other means might never be known.